Ivo Hodek is one of the most internationally respected experts on coccinellids who has researched these insects for his entire career. He has now brought together 14 scientists of international standing to author 12 chapters, making this book the definitive treatment of coccinellid biology and ecology. This volume covers the rapid scientific developments of recent years in the understanding of coccinellid phylogeny, the semiochemicals influencing their behaviour and of molecular genetics. Recent insights in relation to intraguild predation and the assessment of the predatory impact of coccinellids are also covered. Other special features of the volume are the extensive references covering the literature from both East and West and a taxonomic glossary of the up-to-date nomenclature for species of coccinellids as well as of other organisms mentioned in the text. While aimed at researchers, university teachers and agricultural entomologists, the book is readable and appropriate for others who just have a liking for these interesting and attractive insects. 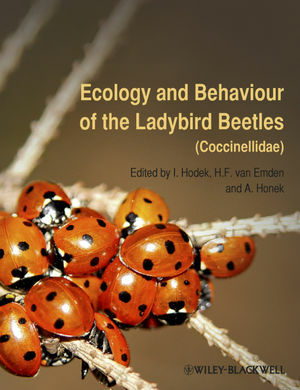 Ivo Hodek has worked on Coccinellidae for over 50 years with most of his career spent at the Institute of Entomology, Biology Centre, Czech Academy of Sciences. Here he was Head of the Ecophysiology Laboratory (1990-1998), and now holds an Emeritus Scientist position there. He has also researched and taught in The Netherlands, France and Japan. He was awarded the J.E. Purkinje Medal of the Czech Academy of Sciences in 2000. In 1965, he founded the "Ecology of Aphidophaga" series of symposia, and since 1985 has been the Editor of the European Journal of Entomology. Alois Honek has taught insect ecology since 1972, and since 1972 has been Senior Research Scientist, Crop Research Institute,Prague-Ruzyne, specializing in invertebrate and plant ecology with many research studies on Coccinellidae. He has also had periods of research in Russia and France. After a period of research at Imperial College, London, Helmut van Emden was appointed to the Department of Horticulture at Reading University where he was appointed Professor in 1976 and Head of the Department from 1986-1999. He is currently Emeritus Professor in the School of Biological Sciences. His research has focused on aphids, particularly host plant resistance and biological control. He has conducted several research projects in the tropics and has held visiting appointments at the Universities of California and Queensland. He received the Karl Escherisch Medal of the German General and Applied Entomological Society in 1993.